Prom Dress or Pole Dancer Costume? You are here: Home / blog / Prom Dress or Pole Dancer Costume? One of the many advantages of being a crusty curmudgeon is that I can shake my head, roll my eyes, and mutter about this spring’s sexualized prom dresses displayed by petulant teenage girls taking duck-faced selfies while festooned like bridesmaids and pole dancers pecking about on teeny high-heeled sandals. The guys will be suffering inside a tuxedo while lamenting that the tux rental cost more than a tank of gas and a case of beer. All the commercialized commotion is for a dance that they’ll attend for a few minutes. According to CBS News Money Watch, the average cost of going to the prom is around $1,000 to cover the proposal, attire, limousine rental, tickets, flowers, pictures, and after-party festivities. That doesn’t include additional expenses for hair, nails, pedicures, and make-up applications, presumably for the females. Getting dressed up to go to prom is a special tradition, and I don’t mind the youngsters removing their holey jeans, trench coats, and dog collars to wear some fancy duds. I do reserve the freedom to poke fun at some of the dresses. I grew up on a farm, sewed my own simple prom dress, and was escorted to the dance as a passenger in a cattle truck. I still had a great time, even with a speck of manure on my sensible shoes. For fun indignation, let’s review some of this year’s fashions. The Promgirl.com website offers that latest styles in prom dresses, along with tips for planning and surviving the perfect prom. One voluminous gown, appropriately called the Disney Cinderella Forever Enchanted Keepsake Gown is only $495 and is perfect for an aspiring princess. However, any dress that needs six names is excessive. For only $49, you can buy the Floor Length Maxi Dress that doesn’t even come close to being enchanted or a keepsake. However, it might come in handy in the summer to cover the picnic table. For the indecent ingénue, there’s this spring’s Black Romper for $69. This ensemble should come with a $2 condom. 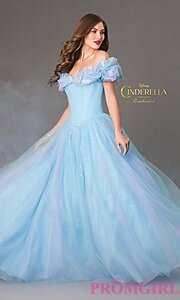 At least the Disney Cinderella Forever Enchanted Keepsake Gown requires a bit of imagination. It’s interesting to note that prom.com offers 62 styles of prom dresses for pregnant women, just in time for the dances that will come eight months after the spring fling. The “shimmering foil jersey fabric with seductive mesh detailing” is advertised as a knockout prom dress that accentuates all the right curves. Those of us with back fat and the desire to sit down should not attempt this garment. Not many parents are buying the outfit because the price is reduced from $278 to $99, but that’s a bargain for any future stripper. A credit card reader is optional. One sophisticated prom dress costs $1,224. You can get the same look by shrinking a $5 t-shirt and wrapping yourself in $45 worth of satin. Stash the remaining $1,174 into your college fund and plan your own clothing line. Maybe it’s with nostalgia instead of criticism that I disapprove of modern styles. I vaguely remember being young and idealistic when preparing for the prom, and I have fond memories of all the crepe paper streamers, printed dance cards, loud gymnasiums, and grand processions. It was that unique time when we all wanted to grow up, and we didn’t have a clue what that meant. So, I’ll smile at all the young couples stuffed into costumes, corsets, and cummerbunds, and encourage them to enjoy life before they turn into cantankerous curmudgeons. Just stay off of my lawn. I can hardly wait to hear your reaction when your granddaughters get ready for their prom nights. You’ll have lots of time to further hone your curmudgeon by then. So true, Ruth. I hope they realize my humor barks more than my harassment. You crack me up. Can we be neighbors and not work out together? I think my youngest went in the one that needed the card reader. She now makes a boat load off that fine figure. Wow they sure do go from one extreme to the other! I am so glad that no longer have to go through this yearly ritual with my kids. I can only imagine what they will look like by the time our grandkids get old enough for prom! Maybe it will be a “virtual” prom to combat teen pregnancy! Lol, this article is pretty funny. Thanks for giving me a smile.